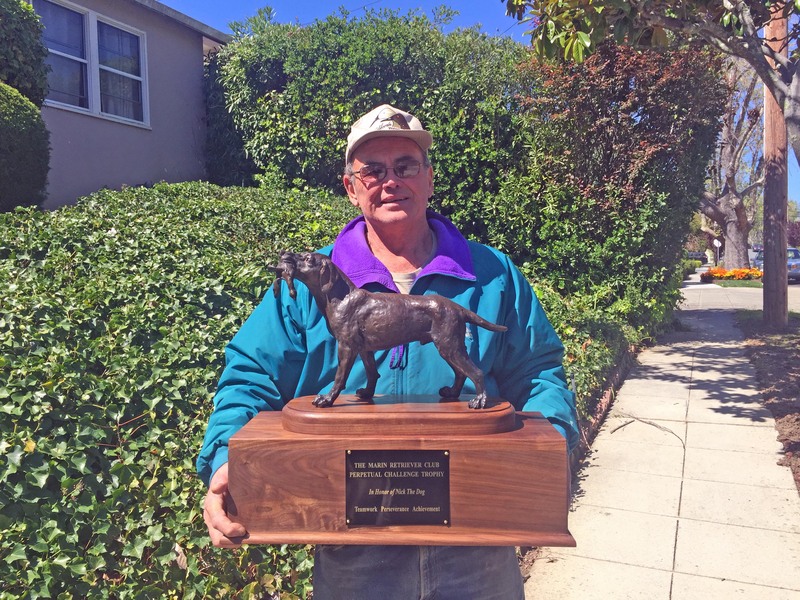 The Marin Retriever Club is proud to offer a new perpetual trophy for its members. This trophy will be presented annually at the Holiday party to the current MRC member who has accumulated the most points as a team (same handler/same dog) in AKC Hunt Tests and/or AKC Field Trials. The trophy has been generously developed and donated by member John Schulte. Thanks John! It will be up to the individual members to tally their points and submit them to the Awards Committee in November of each year. More details about qualifying for the award can be found on the website in the members only section under Policies (Policy # 2017-002). Gary Kaiser, a retired Burlingame Police Office built the trophy. In addition to being an avid outdoorsman who hunts with his Labrador “Abby”, Gary is an accomplished craftsman. John had purchased a bronze statue of a retriever and together he and Gary designed the trophy. Gary selected clear heart walnut for the base including creating an oval for the statue to be affixed. He then utilized all his considerable skill in constructing the base. All-Star Awards produced the plaque and added 8 bars (small plaques) to be placed on the base as the winners are added. The trophy is now safely on John's bureau on top of a serving tray Gary built to carry the trophy. When it came time to settle up, Gary only charged for the wood he purchased, all his time in design and handicraft were gratis. Thanks Gary!